in a somewhat deteriorated state, is housed today at the Teign Heritage Centre in the county. 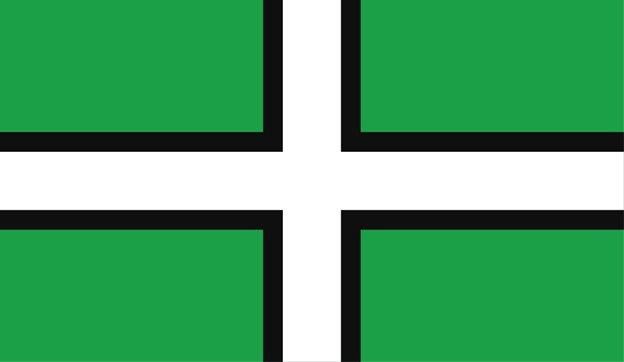 Specifically, the green of the Devon flag is held to represent the county’s rolling lush hills and black the high windswept moors of Dartmoor and Exmoor, while the white represents both the salt spray of Devon’s two coastlines and the China Clay industry. Notably, the juxtaposition of the green and black colours breaks the heraldic rule of tincture that is generally applied to flag design, to help to distinguish the darker and lighter shades in a flag, particularly when seen from any distance. 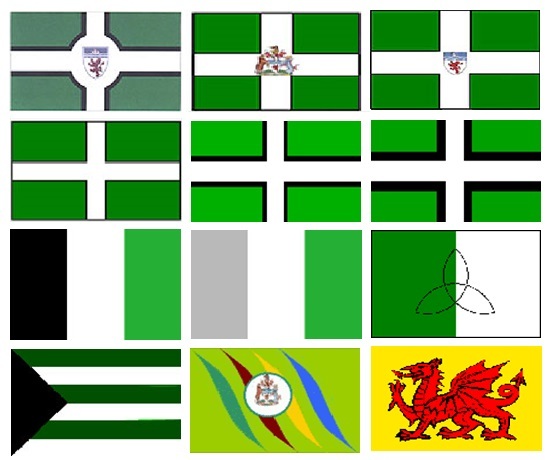 Most of the designs used the traditional Devon colours of black, green and white as described and the notion of a black edged cross appeared six times amongst the shortlisted proposals, several of the submissions being all but identical, varied only by the degree of thickness of the black edging of a white cross. 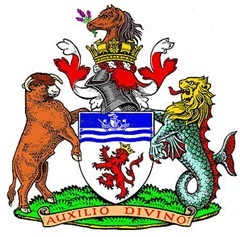 Four of the ideas included the coat of arms of the Devon County Council; these are the property solely of the county council and could not have actually appeared on any other flag. 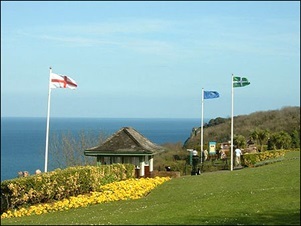 The creation of the flag drew criticism from Cornwall with claims that the move was an attempt to “hijack” Cornish culture. 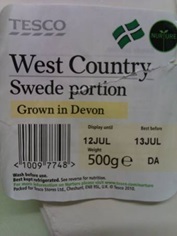 The term “Devonwall” was coined to describe what was seen by some as an attempt by Devon to hijack Cornish identity. Leading Cornish nationalist John Angarrack commented. 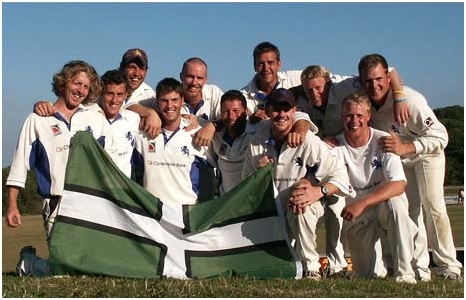 “Promote Devon all you want, but do not denude Cornish distinctiveness in the process…Devon is a county of England despite any dodgy marketing ploy like the Devonshire flag.” This attitude reflected the convention that the Celts were forced out of Devon, and into Cornwall by the Anglo Saxons, rendering the county as English as Surrey or Kent. 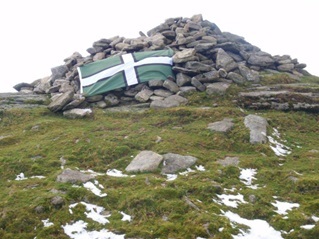 Passionate Devonian Paul Turner argued however that the Cornish were “feeling threatened” by Devon’s new found Celtic pride. Dr Mark Stoyle, a Devon historian further observed that “People are quite aware in Devon that the Cornish make political capital by claiming to be different…besides, it’s fashionable to be a minority.” And Bob Burns accused the Cornish of “distorting history” in a bid to carve out a separate identity from their neighbours. 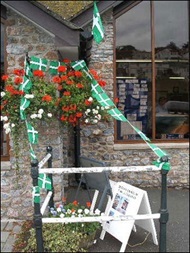 Cornwall’s leading historical scholar, Prof Philip Payton, in turn accused Devon of “wanting to invent traditions…The idea of naming the flag after St Petroc is gratuitously offensive,” Petroc was born in the sixth century probably in South Wales and is associated with a monastery at Padstow in Cornwall, which is named after him, Pedroc-stowe, or ‘Petrock’s Place. He has associations across the south west, such as the Devon villages of Petrockstowe and Newton St Petroc but has traditionally been considered a Cornish saint. However, in spite of the controversy it engendered, the Devon Flag quickly gained popularity, “In a few months it has achieved the sort of popularity that takes years or decades for most regional flags,” observed Charles Ashburner, of Mrflag.com. 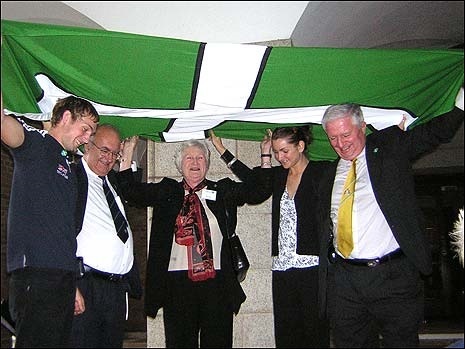 In October 2006 it gained “official” recognition when Devon County Council raised the flag outside County Hall. Councillors are seen here preparing for the event. 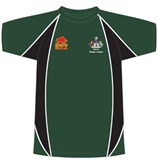 by the county’s Short Mat Bowling team, who also sport a significantly green, black and white kit! the highest point of Dartmoor and the summit of Devon. 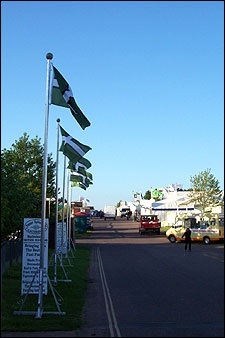 The flag is now widely and commonly seen across the county and has been adapted for business and products. displayed by a fishing boat on Beer Beach. Hopefully this practice might be extended nationwide with the appropriate county flags appearing on respective county produce. which belong solely to the council and no one else may actually raise it. It is not the county flag. 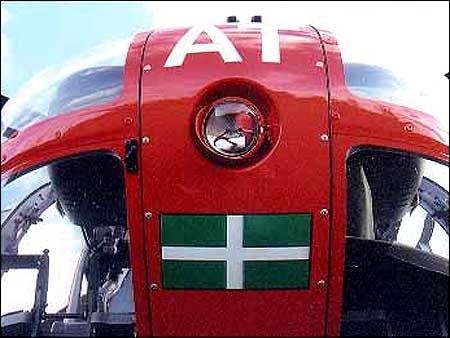 A group exists, Bring Back The Devon Flag, promoting the use of the banner as the flag of the county. The campaign’s name indicates a misapprehension regarding the council’s armorial banner; it cannot be “brought back” as the county flag because it has never been the county flag! 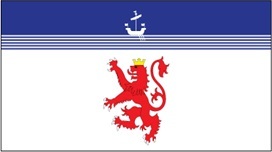 Additionally, stylistically, the armorial banner is not an effective flag, the waves and ship elements found on the arms could have made useful charges on a distinct flag but as a whole the arms are both rather too detailed and insufficiently distinctive – red lions are hardly a unique charge – to serve as an effective flag. 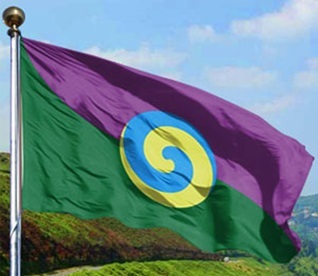 Another campaign, North Devon Flag, promotes a flag specifically for the territory of north Devon per se. 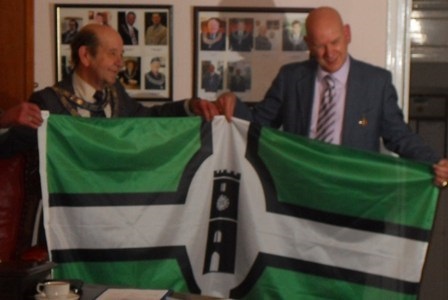 Cllr’s Howe and Corney-Walker with the Newton Abbot flag. flag design. 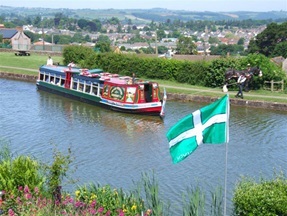 The flag was adopted by the town council in 2009 and incorporates a depiction of In the ancient tower of St Leonard or “The Clock Tower” as it now more commonly known by locals.It is thought that building work for the Church started in about 1220 according to a reference regarding the foundations of a building sited on the meeting place of 3 roads. The flag is accordingly also held to symbolise this ancient town cross roads.